The second season is here. The 2018 state football playoffs kicked off on Friday and kicked off in style, with big wins and thrilling upsets all over the place. With all of the night's Week 10 action going on, Pamplin Media Group's sports editors, reporters and photographers were out in force to document a bunch of it. Scappoose and North Bend went predictably toe-to-toe in a main event fight for playoff survival on Friday night. The Indians made a few more key plays — and got two big kicks off the toe of a sophomore soccer player — to win 20-14 and notch their first playoff victory ever in Class 5A. Now the former 4A Indians are headed to Pendleton for a rematch of a regular-season league game — and this time it's for a berth in the state semifinals. Revenge can be sweet — very sweet. Opening the state playoffs with an impressive victory can also be very satisfying. Put them both together, and the feeling could be downright euphoric. Just ask the Sherwood High School football team. 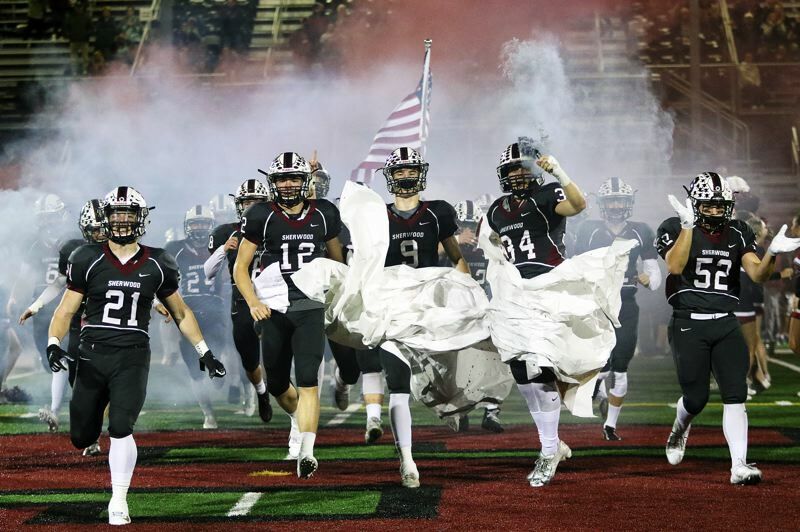 The Bowmen, who opened the 2018 season with a 24-7 home loss to Sandy back on Aug. 31, opened the Class 6A state playoffs by running to a 42-14 win over that same Sandy squad in a first-round postseason game played Friday at Sherwood High School. All smiles and hoisted on the shoulders of his Reynolds football teammates, sophomore Miles Wilson was the recipient of "MVP" chants Friday night at the close of a first-round state playoff game Friday night at South Medford.